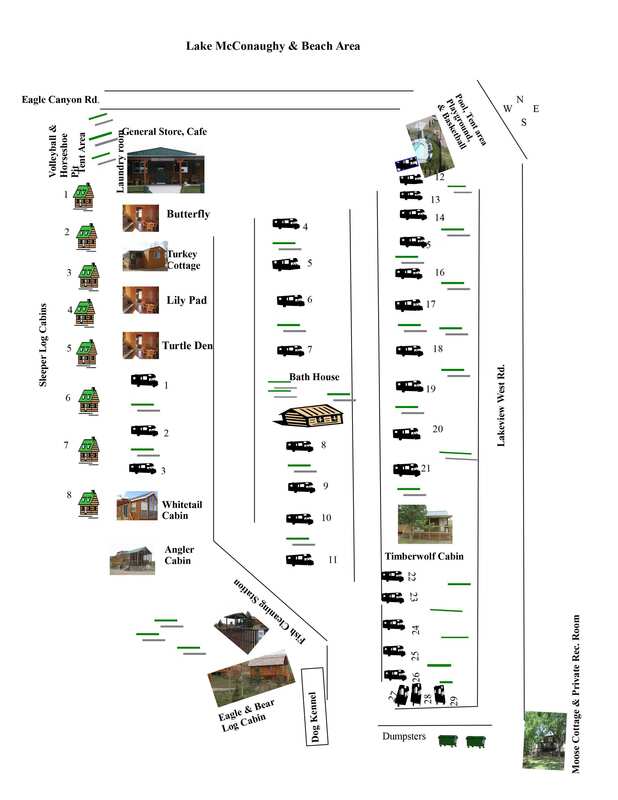 Please view our Park Map and Directions to our campground below. Be advised that GPS will NOT give you accurate directions to Eagle Canyon Hideaway, please follow the directions below. Take the Brule exit 117 and go north to Hwy 30. Turn right (east) onto Hwy 30 and travel 7 miles to Hwy 26/61 junction. This will be just west of Ogallala. Turn left (North) on Hwy 26/61 and travel 3 miles. Turn left (West) on Hwy 26 and travel 5 miles until you see LAKE VIEW ROAD/PUBLIC ROAD 18. Turn right (North) and follow for 3 miles. Watch for “EAGLE CANYON HIDEAWAY” sign and turn left (West) onto LAKEVIEW WEST ROAD and travel 5 miles. Last 1.5 miles is gravel road. 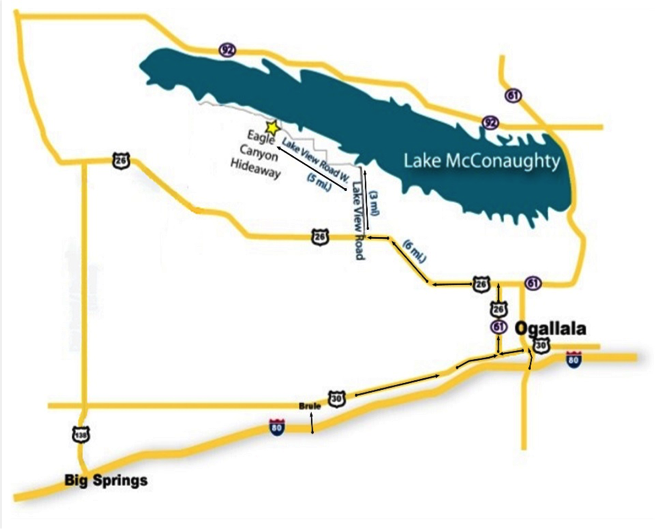 Take the Ogallala exit 126 and follow HWY 26 North to HWY 30. Turn LEFT onto HWY 30. One mile west of Ogallala, watch for HWY 26. Turn RIGHT (North) and follow until it dead ends into HWY 26. Turn LEFT and follow 6 miles until you see LAKE VIEW ROAD. Turn RIGHT (North) and follow for 3 miles. Turn LEFT onto LAKEVIEW WEST ROAD. Turn LEFT (West) and follow for 5 miles. Last 1.5 miles is gravel road. 2 miles past Bayside Golf. Eagle Canyon Hideaway will be on the left.